La Tomatina in Bunyol, close to Valencia, is the biggest food fight in the world. At 11:00, five tomato filled rockets are sent skyward to mark the start of La Tomatina Festival. For two hours, twenty thousand people armed with tomatoes launch into a frenzy of flinging, slinging and lobbing - it's every man and woman for themselves. The Ivrea Orange Throwing Festival takes place 40 km north of Turin. It is a four-day celebration which culminates on Shrove Tuesday with an orange fight involving 10,000 people. As chariots charge around the streets, various orange battles develop all over town. No-one feels guilty about chucking huge great quantities of oranges - they're the excess from the Italian harvest. The carnival is more than just a sea of orange juice. In among the crowds, a young, recently married volunteer tours the city as Violetta, the heroine of the insurrection and dressed in white, throws candy to the spectators. There are very few rules in La Tomatina - it is compulsory to squish your tomato before sending it into the red blur of the crowd before you, and other projectiles are not allowed. Don't worry about running out of ammunition because there's a monumental 125,000 kilo arsenal of ripe fruit. Don't count on recognising your friends, or them recognising you for that matter. Within hours, though, the town is transformed back to its former self. Shopkeepers take down their tarpaulins and everyone chips in to hose down the town and return it to its former "tomato-less" glory. The tradition was born way back in 1945 when some locals got carried away in a restaurant food fight. The authorities frowned upon the festival until 1959 when they simply gave in to the overwhelming desire to spend a day throwing over-ripe tomatoes. In brief.... What is La Tomatina? The Tomatina is only one of the celebration of a week long festival with musical bands, fireworks, food, and over all fun. This is a war were there are expected to be no winners, but where all have fun. La Tomatina takes place in Buñol, a small town 25 km (about 30 miles) west of Valencia and well connected by train and bus. On the last Wednesday of August, at the peak of tomato season, between 10 am and 1 pm. Everybody enjoys and the streets turn into rivers of tomato juice. Arrival in Valencia - check-in city centre hotel. Optional day to play golf, explore the fabulous old town of Valencia or the fabulous beaches. In the evening there will be a pre-tomatina party! 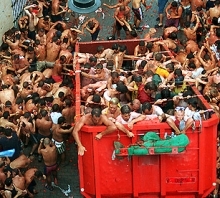 La Tomatina Festival: Early transfer to Bunol for the world famous 'La Tomatina' tomato fight. The preparations start in the early morning and by midday it's time for the festivities to start. The tomato fight lasts for one hour and is an experience you will never forget! Check-out of hotel. Transfer to airport for return flight. Another popular fruit festival is the Ivrea (near Turin) three day orange-fight which involves the whole town and a bonfire in the main square. This Italian carnival started in 1808, and due to historical overtures, fancy dress plays a key part, with an extensive number of one armed Napoleonic Generals. The orange fights are held between people on foot, representing the masses, and hooded people standing on horse drawn wagons. As these Spartacus-like chariots charge round the streets various orange battles ensue all over town. The main events take place on the Saturday, Sunday, and Monday running up to the all out grand finale on Shrove Tuesday, February. For both events, you can fly in a private jet for the battle - fly directly into Valencia or Turin, spend a night in a local hotel and be up and ready for a fruit onslaught! After the event, lunch will be laid on at a premier restaurant and spend the afternoon taking the sights and sounds before flying back at 20:00.